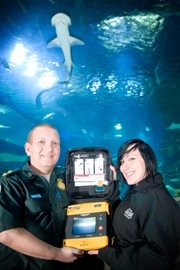 Visitors to SEALIFE London Aquarium can now be assured of receiving the very best in service from the first aid team, following the installation of a life-saving defibrillator. Defibrillators are machines that can deliver a shock to restart a patient’s heart, should they suffer a cardiac arrest, and every year they save hundreds of lives. The London Ambulance Service receives around 100,000 calls each year to people complaining of chest pain, one of the main signs of a heart attack. These calls are often to public places: train stations, airports, tourist venues and workplaces. The Service’s Community Defibrillation Office Martin Bullock is working to place defibrillators in a variety of these venues across the capital and SEALIFE London Aquarium is the latest lucky recipient. The London Ambulance Service has been responsible for maintaining and training members of the public to use public-access defibrillators since 2004. There are over 500 public defibrillators in London, the largest number in any location in the UK, and trained over 6,100 people to use them. Out of the 113 patients treated with a public-access defibrillator 32 have survived to hospital discharge, a much higher survival rate than the rest of London.